‘The Jolly Beggars’ in London after 200 years! As some of you will have seen via our twitter account, we took Burns’s cantata ‘The Jolly Beggars’ to London last week. 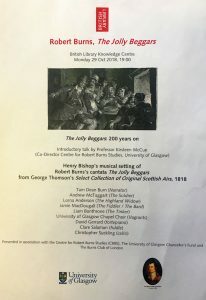 If you look back through our ERB21C blogs you’ll note that this, in its first musical printing, is part of the forthcoming edition of Burns’s Songs for George Thomson. We performed it for the first time (short of a few documented early 19th century performances) back in 2016 in the University Chapel here in Glasgow. But we then undertook even more work on the piece for the edition, which is now in production with Oxford University Press and is due to appear late in 2019. You can see the full score and read the story of Burns’s cantata and how Thomson edited it in 1817-18 when our new edition appears. In the interim, I had a request from friends at the Burns Club of London, who were keen to see the piece performed in the city as part of the Club’s 150th celebratory events. This made perfect sense, especially in 2018, as this year marks the 200th anniversary of the printing of the work. Burns’s editor, George Thomson, had chosen to invite the London theatre composer and musical director Henry Rowley Bishop to provide a new musical score for the work and it was printed, like Thomson’s other National song volumes, by the London music publisher Preston & Sons. 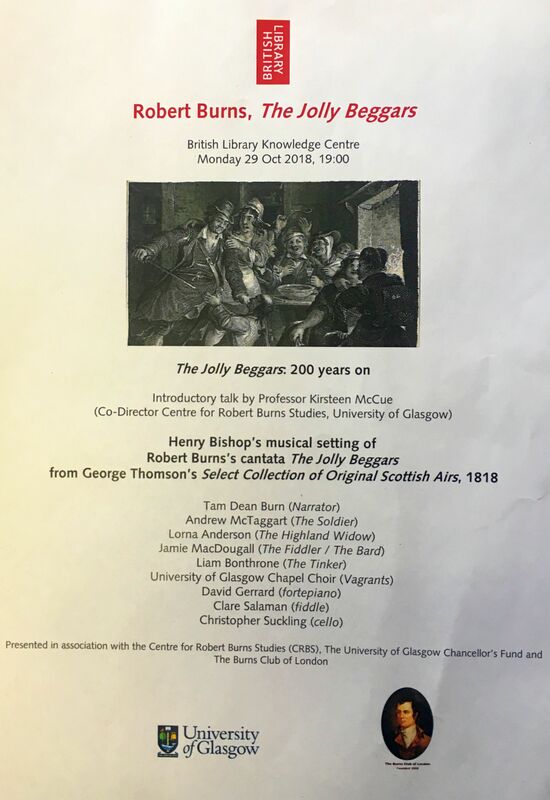 What made even more sense was to ask if we could hold the event at the British Library, because all the correspondence about Bishop’s musical setting of Burns’s work is held in the manuscript room at the BL. 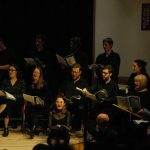 With the encouragement and support of Dr Rupert Ridgewell (Head of Music Collections) at the British Library and the team in the Knowledge Exchange Centre there we pulled together a performance of the cantata that took place last week! Over and above those mentioned already, the Chancellor’s Fund here at the University of Glasgow helped make it possible to bring together the previous cast of formidable narrator, singers and players (with a few changes) and to enable the singers of the University’s Chapel Choir with their wonderful director Katy Cooper to come down to be Burns’s ‘vagrant’ chorus. While the theatre space at the BL might not seem the most convincing Mauchline drinking ‘howff’, in fact we were able to make really good use of the space. The performers all stepped up, bringing out, not just the musical setting, but a real sense of the piece as a dramatic work. Moreover, plenty of drinking was able to take place after the performance, as the Burns Club of London kindly hosted a reception! 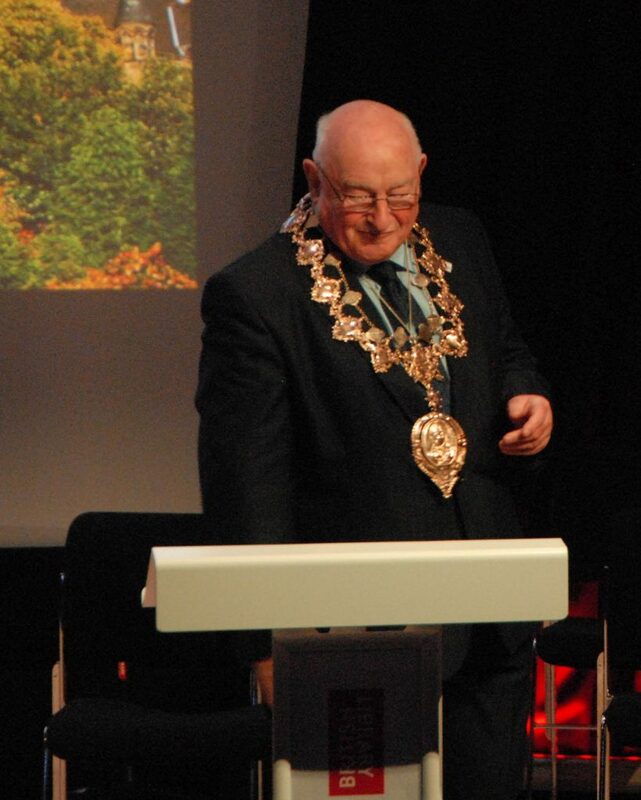 The evening began with an opening address by the President of the Robert Burns World Federation, Bill Nolan. 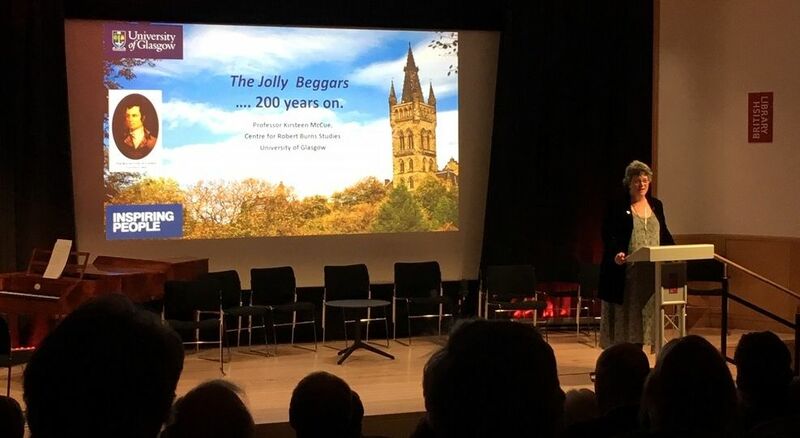 And I then gave a public lecture presenting a bit of background and context to the piece and focussing on the three men who made it all happen: Burns, Thomson and Bishop. This allowed me to mention the complex publishing history of Burns’s work; Burns denied knowledge of it when Thomson asked him about the cantata in 1793 and it never appeared in print during Burns’s lifetime. I then focussed on Thomson’s interest in the work, and his determination to include it in his Select Collection of Original Scottish Airs where it eventually appeared in the fifth volume in 1818 (the same volume that included musical settings by Ludwig van Beethoven). And I explained several of the omissions Thomson made in presenting this bawdy text for his ‘fair countrywomen’. I was also able to show everyone Thomson’s letter of invitation to Bishop from the British Library Thomson letter books, and to show how Thomson and Bishop collaborated on the final score, including Bishop’s detailed account of how he set out to capture the mood of Burns’s poem in his ‘symphonic’ introduction for piano trio. Bishop was busy at the time in the role of Musical Director of Covent Garden, but he was keen to accept the invitation, as he wrote to Thomson in 1817, ‘from my respect for you, my admiration of the immortal Burns, and the ambition I feel for a name in Scotland’. Our bard and fiddler, our highland widow and our solider were all singers who helped bring the work alive in 2016 – namely Jamie MacDougall, Lorna Anderson (both already known for their formidable recordings of all of Joseph Haydn’s folksong settings for Thomson on Brilliant Classics!) and suitably inebriated Andy McTaggart (it was apple juice, honestly!). We were joined this time by the young Scottish tenor Liam Bonthrone as the tinker: he has just moved to London to study at the Guildhall School of Music and Drama. 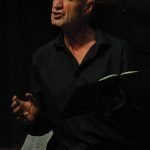 Linking the whole piece together was our narrator Tam Dean Burn, who moved around the space and introduced us in turn to all our ‘randie gangrel bodies’. 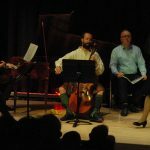 Our piano trio was David Gerrard, who played fortepiano for us also in 2016, and two London-based period string players: fiddler Clare Salaman and cellist Christopher Suckling. Singers from our Chapel Choir, after a very early start, and many of whom were heading back on the sleeper to Glasgow, rose to the challenge, including much moving of seats and even a bit of dancing! Bishop had suggested a benefit performance of the work to Thomson in 1818 which he wanted to take place at Covent Garden. We have not, as yet, found any evidence that this took place. Though Bishop had even suggested a cast of fine singers, including the Scottish tenor John Sinclair. 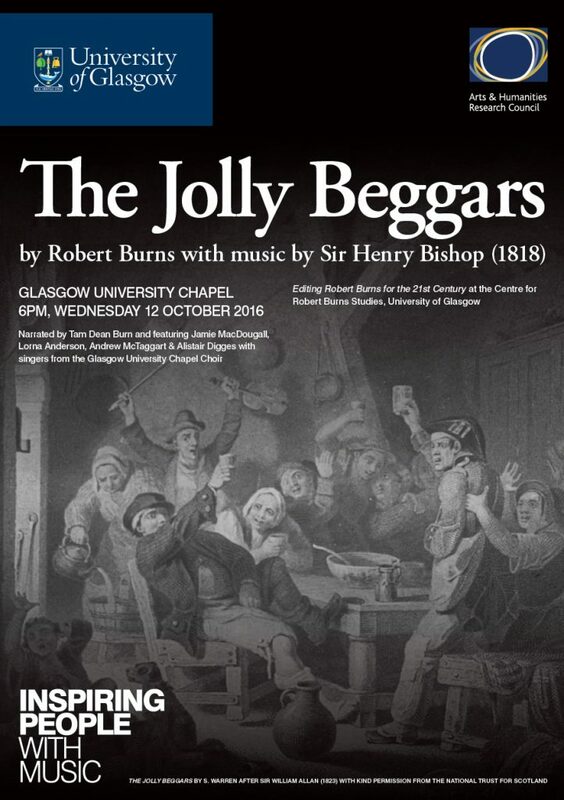 It might seem a long time to wait, but 200 years later, we were finally able to arrange a London ‘benefit’ concert performance of Burns’s and Bishop’s ‘The Jolly Beggars’ after all! Professor of Scottish Literature and Song Culture and Co-Director of the Centre for Robert Burns Studies at the University of Glasgow. Editor for the new Oxford University Press Works of Robert Burns (Vols. 4 & 5) Robert Burns's Songs for George Thomson. Missing Flute Part for The Jolly Beggars – Can you help? Who is the ghostly ‘WR’ in the First Commonplace book?